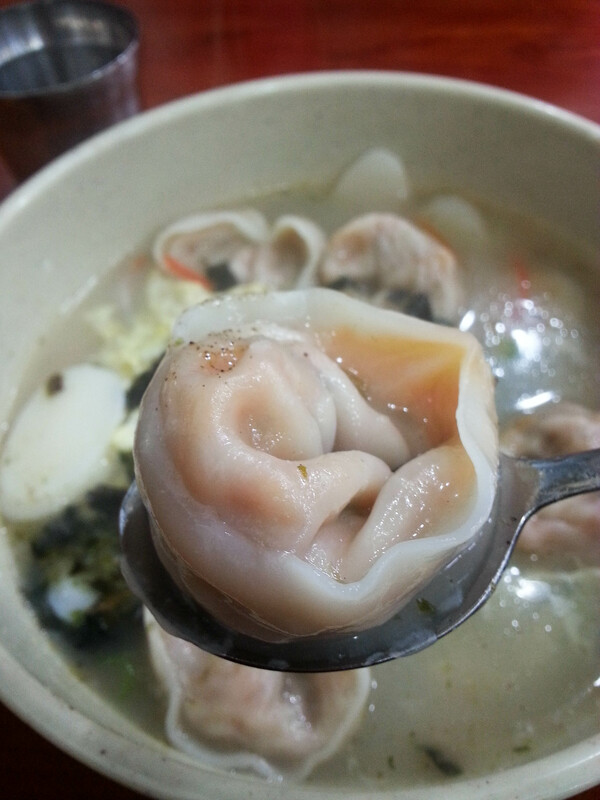 ‘Tis the season to bundle up and eat hot soup, so I thought I’d post about another traditional Korean dish that I like particularly like when it’s cold out. 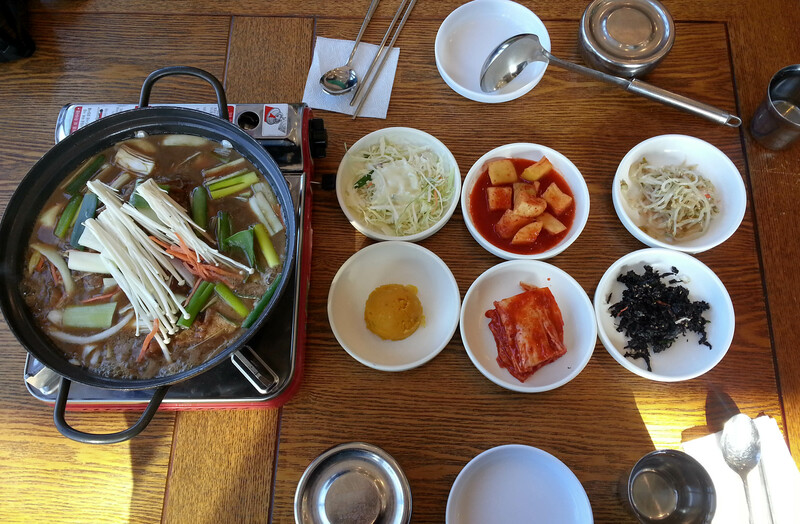 Doengjang jjigae is a stew made with fermented soy bean paste, or doenjeang, which is an essential element in Korean cuisine. 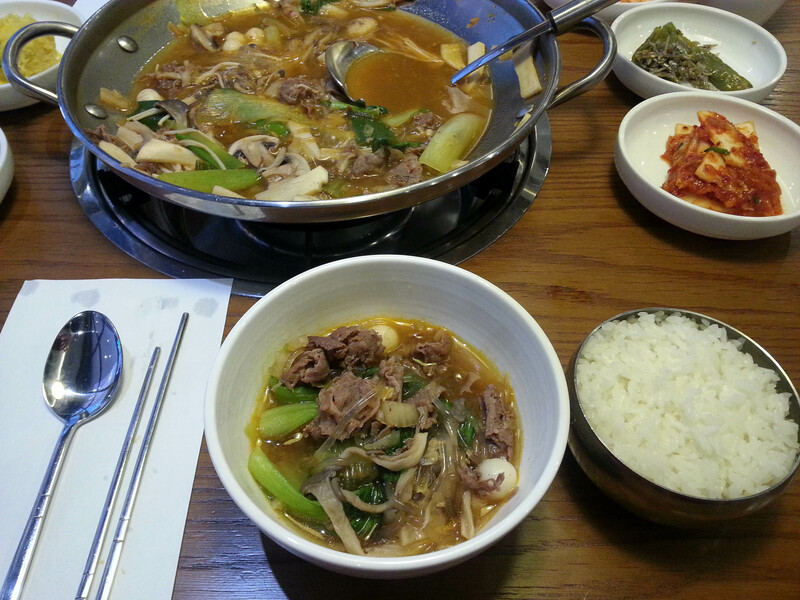 I think many foreigners are initially turned off by this dish, mostly because doengjang is so pungent. Fermented soy bean paste doesn’t necessarily sound too appetizing, either. 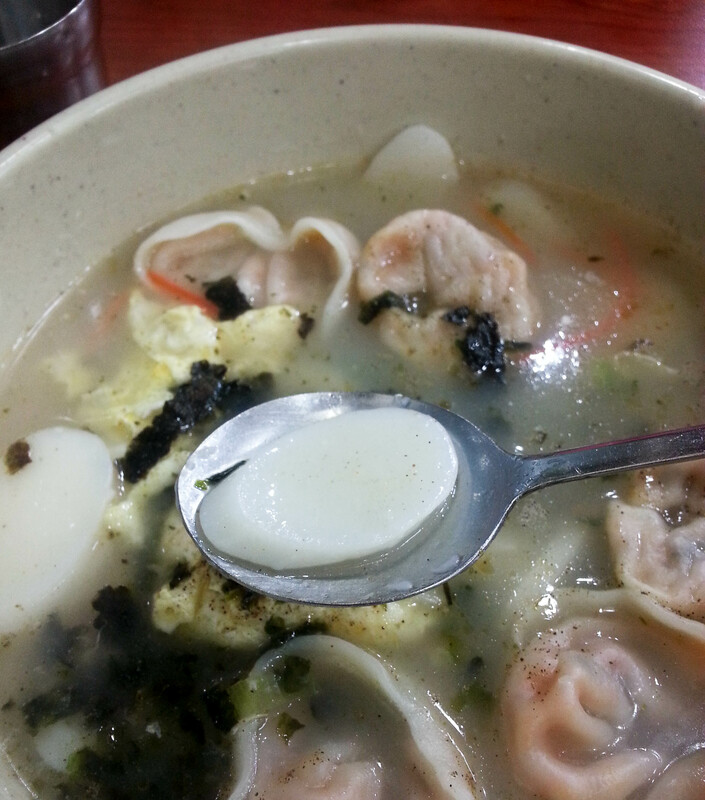 However, the hearty flavor of this dish is unlike any other soup or stew I’ve tried, and I love it. 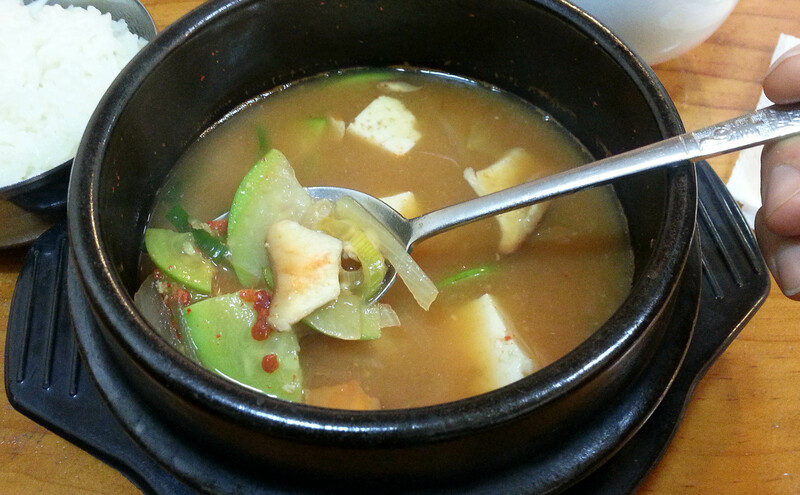 The broth is usually comprised of doenjang, anchovy stock, garlic and Korean red pepper powder or flakes (gochugaru), which creates a perfect blend of spicy saltiness. Onions, zucchini, tofu, mushrooms and potatoes are added to the broth, making a deliciously balanced stew (clams, pork or beef are also sometimes included, depending on the recipe). Doenjang jjigae is often served as a side dish at barbecue restaurants, but lately I’ve been ordering it on it’s own with a bowl of rice for a cheap, healthy and quick dinner. If you ever have the opportunity to try it, I highly recommend doing so. 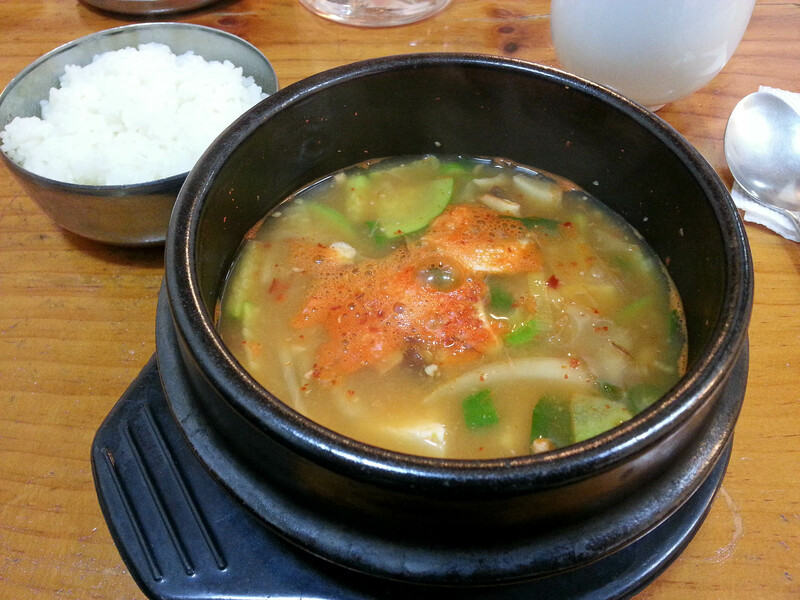 Doenjang jjigae is served sizzling hot in a stone bowl along with a side of rice. This version was made with onions, zucchini, mushrooms, and tofu. I have yet to try a version with clams or any other type of meat. I also haven’t tried making it on my own yet, but I plan on doing so soon as I know this will be one of the dishes I’ll miss when I leave Korea. Kimbap, also known as gimbap, is the ultimate picnic food of Korea. It’s cheap, easy to make (or purchase) ahead of time and easily eaten on-the-go. 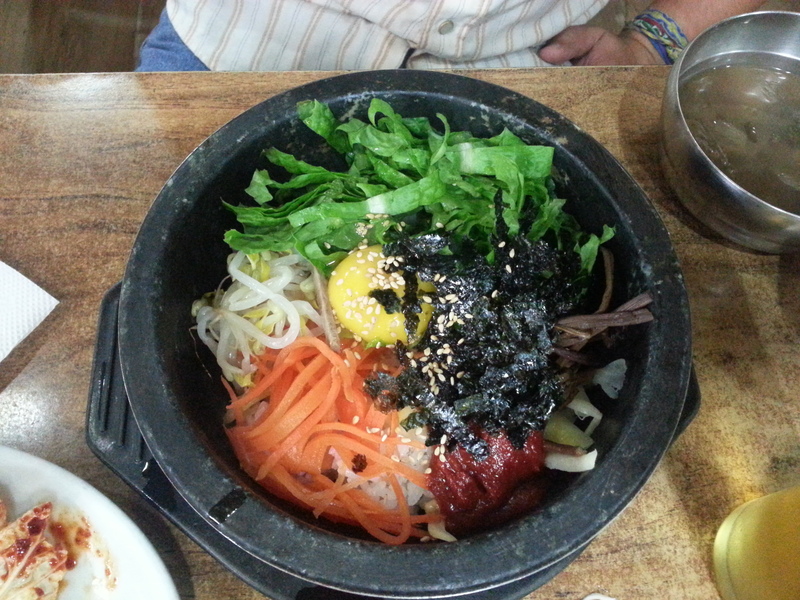 The two main ingredients are dried seaweed (kim or gim) and white rice (bap). Various veggies and meats accompany the rice which is wrapped in sheets of dried seaweed. It looks very similar to sushi, however raw fish is not used in kimbap, and the rice is seasoned with sesame oil and sesame seeds rather than rice vinegar. 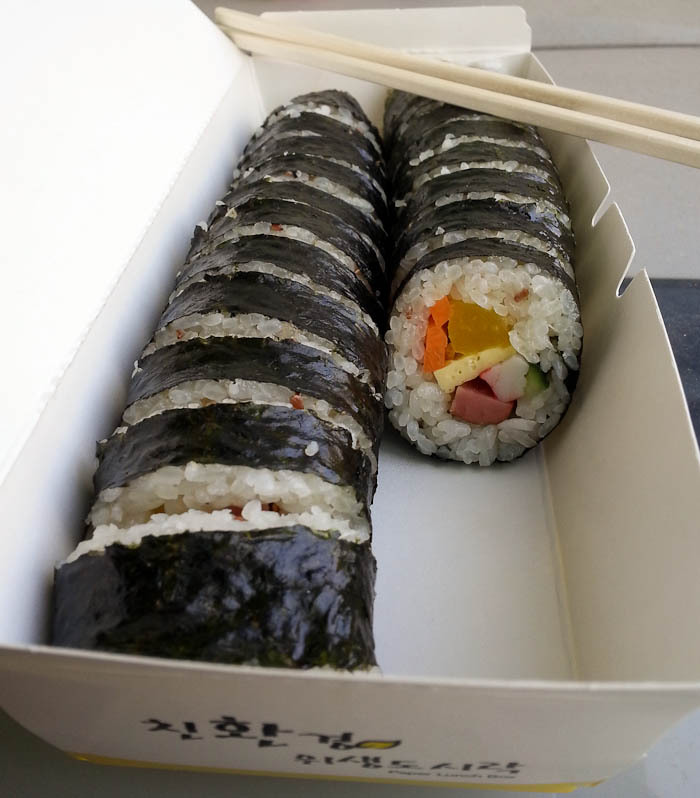 The most common ingredients in basic kimbap are cucumber, carrot, fried egg, radish, imitation crab and spam (yes, spam is everywhere in Korea). You’ll also see canned tuna (chamchi kimbap), cheese (chijeu kimbap), beef (soegogi kimbap) and of course kimchi as ingredients as well. 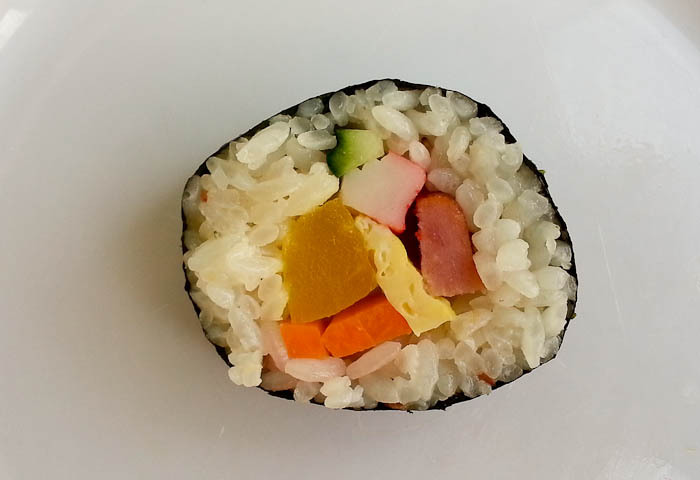 Basic kimbap with carrots, cucumber, fried egg, spam, imitation crab, radish, and rice seasoned with sesame oil and sesame seeds. Unlike sushi, it’s served by itself without any sort of soy sauce, wasabi or ginger. Kimbap to go, all for just $5! 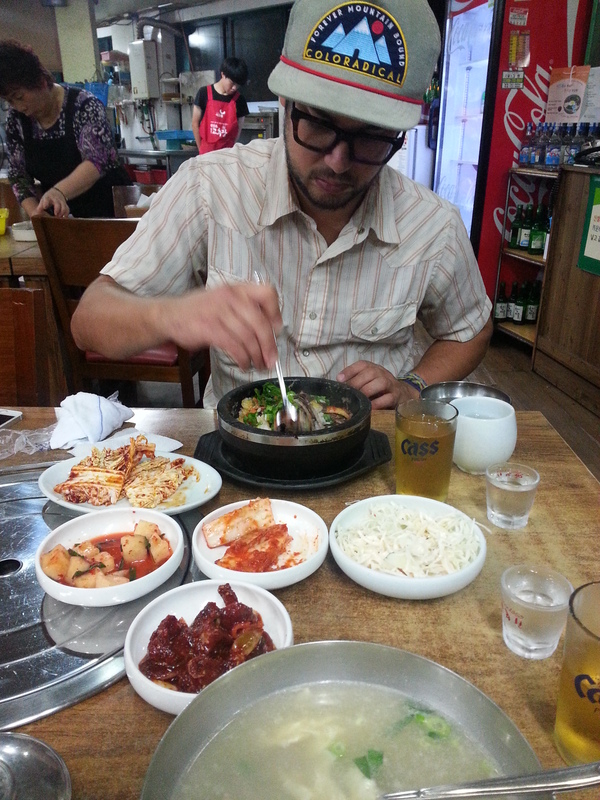 You’ll often see Koreans enjoying kimbap on picnics in the park or while resting on a hike in the mountains. 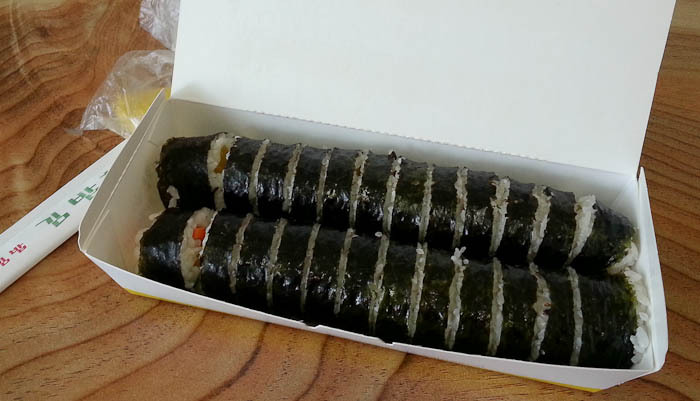 You can even buy it in any convenient store at all hours of the day, either in rolls or triangles which are called samgak kimbap. 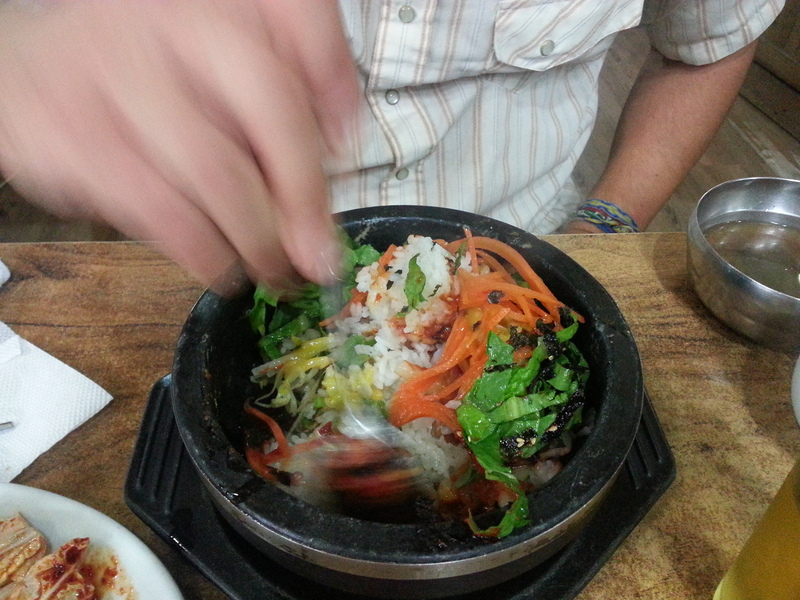 A fancier version of kimbap (excuse the blurriness) with my co-teacher and another English teacher in Cheongju. 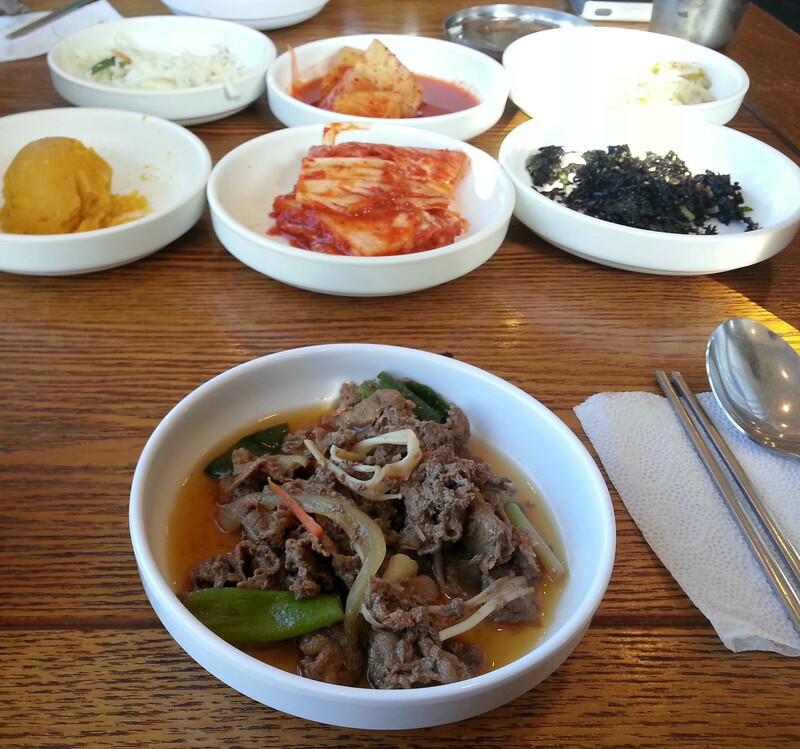 Big fat rolls with bulgolgi (marinated beef) were accompanied by pickled radish, kimchi and bean sprout soup.